I wanted to use this space to give the users some information about the new code and how to take advantage of it. A lot of Apache / PHP installs have an arbitrarily low file upload size limit set (usually 2MB). An average .mp3 file is at least 3-5MB. Video can be way bigger. If you are on a shared host that doesn’t allow uploads over a certain size, you may have to get more creative about where your audio and video files are stored. The only difference will be not having them in your media library. You can use all of the new a/v features with remote files. You may need to change permissions of php.ini to make it writable. If you don’t do this, your server may send the files with a mime-type of application/octet-stream. They might play, might not, but it’ll probably get weird. The simplest way to use the new media shortcodes is to not write them by hand. When you click “Insert Into Post” from Media Library for an audio or video file now, the shortcode will be written into the editor for you. Probably don’t mess with it. If you are a video savant and have multiple copies of your video or audio in all of the HTML5 formats, you can use them all, but you will have to write in the extra attributes by hand. The [audio] shortcode also allows the following attributes: loop, autoplay, and preload (defaults to none). The [video] shortcode also allows the following attributes: poster, loop, autoplay, and preload (defaults to metadata). If you put an audio or video URL on a line by itself – boom, you’re done. A player will show up if the file extension is in the list of supported types. between the URL and the content. Your audio and video uploads now have metadata that is extracted when they are uploaded. Prior to 3.6, no metadata was generated for audio and video files. A/V files are typically created with ID3 tags. ID3 tags contain data like artist, album, song, genre, etc for audio files and length, dimensions, codecs, etc for video. None of the data is guaranteed to be there. If you have uploaded audio or video previously, this data won’t be generated on the fly. We are using the getID3 library to parse the files on upload. The code is elaborate. It is also possible that your media files don’t contain ID3 tags. 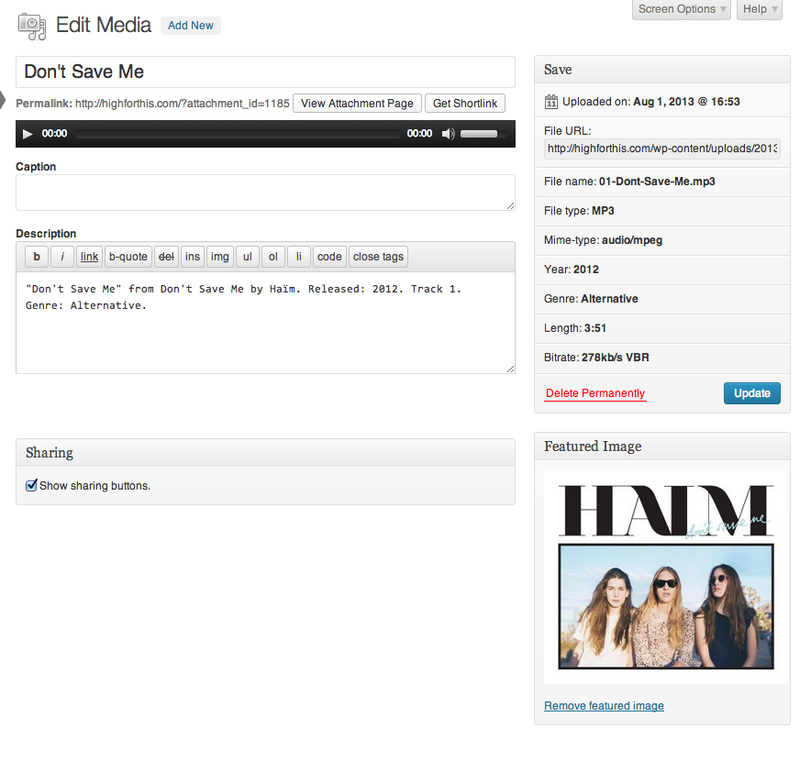 If your files DO contain data, some of it is displayed in the sidebar on the Edit Media page. Some of the fields on the Edit Media page are pre-populated now with data from your ID3 tags, if they were present on upload. If your mp3 contains an image, the image will be extracted, uploaded to your media library, and will be the post thumbnail for your audio file. Reblogged this on Helen on WordPress. Any word on enabling audio/video-based comments? Reblogged this on My Bloghartonobimo.wordpress.com. Am I missing something? The documentation for the new [audio] and [video] shortcodes is sparse – I had to dig into wp-core files just to figure some stuff out about them. can anyone tell me how to integrate the code in a post for displaying the metadata of an mp3 musictitle. I tried but I don’t have the result. I have inserted an audio file from my media library, added the shortcode for it to autoplay and to loop, but I cannot find any shortcode that will work to hide the player. Do you know what works? I have tried the terms display, hidden, and invisible set to none false yes true – none of them work. Do you have any ideas?